I say ditch, because the fact that it was a Moorish irrigation line to my off-grid home in Spain makes it sound too romantic. When you're freezing cold and dirty you don't care who built your water system, you're just dreaming of all the hot baths you've left behind. I've been thinking a lot about these tough times since the recent reports of the children taking part in the Youth Strike 4 Climate events. These kids are very photogenic, with their painted faces and their heartwarming slogans, like "I speak for the trees" and "Burn incense not coal". But do they know what it's like to live like you mean it? I agree with environmentalist George Monbiot when he says the youth-strike children shouldn't have to be "living in a barrel, with no clothes or possessions" for us to take their concerns seriously. But they do have many lessons to learn if they really want their generation to make an impact. 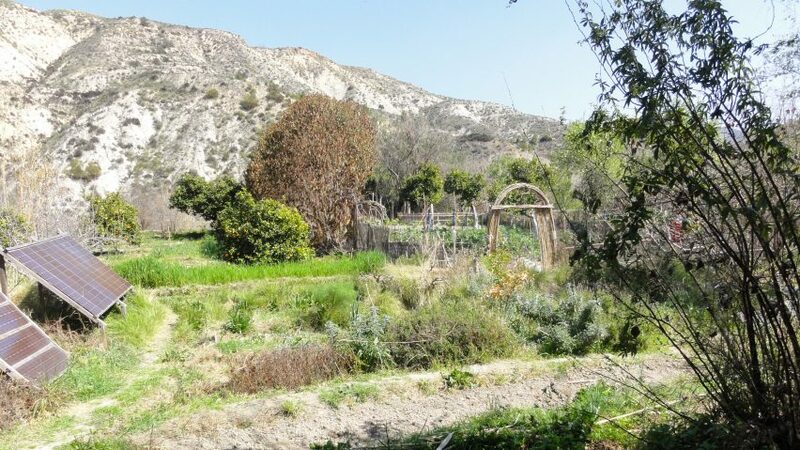 My own journey started in 2005, when I spotted an off-grid house for sale in the Spanish eco village of Los Molinos del Rio Aguas. I had spent 15 years in London working as a journalist, first on the Architects' Journal and later at Blueprint and the Independent on Sunday. Our small village house had been rebuilt from a ruin by a British environmentalist and his wife who were moving to Wales to expand their organic seed business. "I don't know how much you know about anarchist theory," Ben began when we first met him, by way of explanation for how he came to be living in what on the surface seemed like off-grid paradise. Although the house had a WC, we soon learnt the novel squatting technique necessary to use the outdoor compost toilet. This delightful structure had collection chambers in its base and a roof of solar panels, all surrounded by a dense screen of grapevines. In theory the "humanure" we made could be dug out and used as compost for fruit trees, making the whole little building a multi-purpose power pack. There were also tensions in the community. When all your neighbours are idealists, it's extraordinary how quickly disagreements break out about the best way to live or solve problems. There are extremists in the green movement, just as there are in any community, and there were often people in the village who were so strict in their vegan, anti-oil, anti-capitalist, anti-children (due to concerns about the effects of population increase) position that their faces were fixed in a constant expression of disapproval. Despite the downsides, I look back on my eco-adventure as a very happy time. And now I'm living back in Britain I often think about how the lessons I learnt could contribute to the UK Climate Change Act's commitment to cut our 1990-level of carbon emissions by 80 per cent by 2050. Certainly there's a mammoth task ahead. The Youth Strike 4 Climate movement has captured the public imagination with its demand for government action, and it's clear that national and international legislation can make the biggest leaps in environmental protection. Moves against diesel emissions, plastic bags and river pollution for example have had dramatic effects. And as Harvard professor Steven Pinker has pointed out in his recent book, Enlightenment Now, there is plenty to be positive about. The wealthier countries become, the cleaner they generally become, and more able to protect their natural assets. With 86 per cent of the world's energy still coming from fossil fuels, it's clear that increased development of alternative technologies like wind and solar power are a priority. Governments must take a lead role in this, and we can't assume that leftwing governments will be any better at it than rightwing ones. When jobs and profit come first, the environment often suffers. Heavy industry is still the biggest emitter of the world's greenhouse gasses at 29 per cent, and no government wants to close down car factories, quarries or steelworks, so the pressure must be on making them cleaner, whoever is in charge. Architects also have an important role to play. Buildings are not far behind industry, emitting 19 per cent of the world's greenhouse gases. We are still way too blasé about the materials used in construction, the energy they take to make and transport, and the power buildings use to stay warm or cool. But as Steven Pinker says, the progress gained through legislation and technology "doesn't mean that we can sit back and relax". Everybody needs to play their part in this fight. And this is where the lessons I learnt in Spain are most useful to me. After my cold-turkey experience, it's now second nature to use only the lights I need at home, to heat water and rooms sparingly and to treat such things as a luxury. I recycle water at every opportunity, and applaud Sir James Bevan, chief executive of the Environment Agency, who said recently that he wants to see wasting water become "as socially unacceptable as blowing smoke in the face of a baby". I'm pleased with any food I manage to grow myself, and every time I walk or use public transport rather than my car, I think about the small amount of greenhouse gas that the atmosphere has been spared. I eat a mostly vegetarian diet, with regular vegan days or weeks as a slow transition to the next step. These things all seem like common sense to me now, so I'm surprised when I meet other people who don't feel the same. Veteran foreign correspondent John Simpson recently tweeted his support for making lessons on climate change compulsory in schools. "Since this is the most important problem our planet faces, shouldn't our children be taught about it?" he wrote. I agree, but it makes no sense if you don't teach them the small changes they can make to their lives to counteract it too.